a. A convert who was circumcised and immersed but did not accept the commandments (mitzvot) of the Torah in the presence of three who are qualified to judge, is not a convert at all. Even if he accepted the mitzvot upon himself, if it was not in the presence of three who are qualified to judge, it is meaningless. b. The rabbinical conversion court (beit din) must adequately examine whether the prospective convert has studied and knows the rudiments of faith, and also has studied the basic halakhot of Judaism (as practiced in Israeli rabbinical courts). c. Similarly, they will examine his motives and objectives for conversion. They will examine whether he is sincere in saying that he accepts the Torah and mitzvot upon himself, and is not deceiving the rabbinical court. d. If their assessment is that he will certainly not uphold the mitzvot, they should not accept him as a convert. e. A convert who was circumcised and immersed and accepted the mitzvot of the Torah in the presence of three who are qualified to judge, and everythings was done properly and halakhically, and he then reverted to his mistaken ways and violates the mitzvot of the Torah, he is like an apostate Jew: his wine is forbidden, but his marriage and divorce are valid, as is stated explicitly in the Talmud, the code of Maimonides, and the Shulchan Arukh. The aforementioned statements are the conclusions of responsa that I wrote regarding matters of conversion. I have already made it clear that according to Maimonides, of blessed memory, acceptance of mitzvot in the presence of three who are qualified to judge is indispensable (le-ikuva). I explained in detail his [=Maimonides’s] statements in Chapter 12 of the Laws of Forbidden Relations, in a responsum from 5764 which was printed in Responsa Shema Shlomo VI (Yoreh De’ah 12). I have now clarified the matter again, and these words were viewed by the decisor (poseik) of our generation, our master, the Rishon Lezion, the prince of Israel’s sages, the author of Yabia Omer [=Rav Ovadia Yosef] shlita. He agreed and signed with his own hand and even added, in his own handwriting, that this is the truth of the Torah and that it is a law that must not be violated (chok ve-lo ya’avor. I have also sent all of this to the [secular] Supreme Court, to negate the opinion of those who were mistaken on this matter. Regarding army conversions, it is clear that in addition to the circumcision and immersion being in the presence of a lawful rabbinical court of three, each convert accepts the yoke of Torah and the yoke of the mitzvot upon himself in the presence of a rabbinical court of three. This is after they are taught the rudiments of the mitzvot, as is known, are tested, and spend time with Torah- and mitzva-observant families who have even recommended them. Rav Elyashiv's position prohibiting walking to the Kotel on Shabbat due to the presence of cameras has been widely reported. Rav Yisrael Rozen of Machon Tzomet responds, explaining why it is permitted. 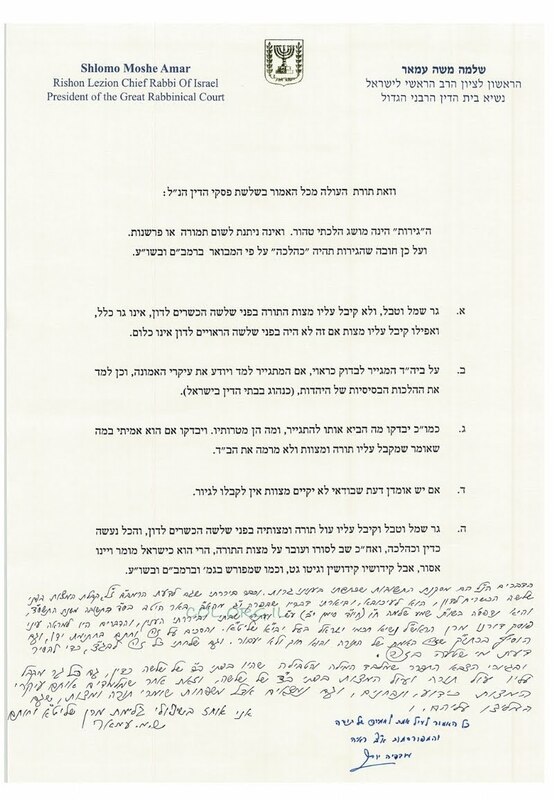 A fuller (Hebrew) correspondence between R. Rozen and Rav Zalman Nechemiah Goldberg on this issue, in which they rule leniently, is available here. Rav Shlomo Aviner explains why he signed the ban on selling homes to gentiles. Rav Yehuda Gilad explains his opposition. Rav Haim David Halevy's lenient position on discrimination against non-Jews in the democratic state of Israel is excerpted in translation here and addressed more fully, with links to further reading, here. Yad Vashem's interview with Rav Yehuda Amital on religious life during the Holocaust has been translated. The original is available here.